Often we hear stories about lone survivalists who were stranded in the wild for days. If they make it out of there alive, you will hear them give credit to their will to survival instincts. What many fail to mention that the most important reason for their survival is water. 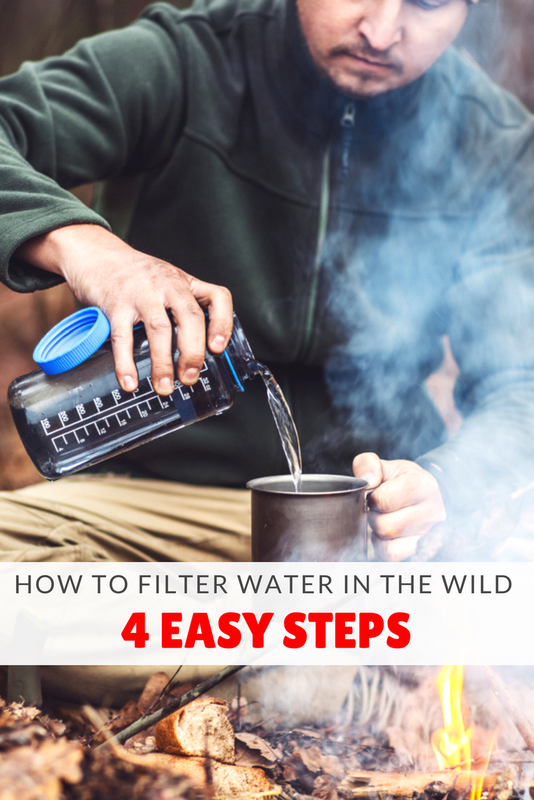 In this post, we will discuss how to filter water in the wild in 4 easy steps. Research has it that a physiological human being can survive for weeks without food. But to survive for more 3 days without water is impossible. In extremely hot temperatures, a person may survive for just a couple of hours without water. So, how do you access clean drinking water in the wilderness if you did not carry potable water with you? The answer is to filter and purify the water. Proper filtering will get rid of contaminants such as bacteria and parasites. These are disease-causing organisms. We can always filter water with tablets, commercial filters or UV pen filters. But finding any of these items in a survival situation can be difficult. Can you depend on Mother Nature to provide you with a solution? The answer is yes. You can learn how to filter water in the wild if you have the right information. Follow a few steps and you will have a clean drinking water. The first step for learning how to filter water in the wild is to improvise support for the filter you are just about to make. Use your survival knife or any other cutting tool to cut a cleaned used plastic bottle into two. We recommend using the Morakniv Bushcraft Survival Knife. Place the top portion of the bottle into the bottom portion in an upside down manner. The bottom portion will act as the collecting cup. Make small holes in the bottle’s cup. These will allow water to drip. 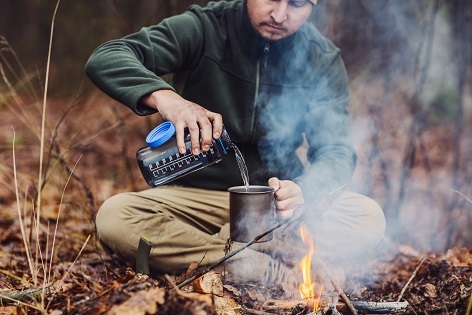 You will need a piece of cloth (like the sleeve of your shirt) charcoal, sand, and gravel to make the filtration unit of your improvised water filter. You will need to put the piece of cloth (preferentially made of cotton fabric) in the mouth of the bottle. This will eliminate even the smallest impurities (or particles) in the water. You can obtain charcoal from a fire you made during the day. The charcoal you use should be the last layer. Charcoal is a powerful adsorbent. It can get rid of many colored impurities including toxins and odors via a chemical reaction. Put a layer of charcoal after the piece of cloth. The next layer that goes on top of the charcoal is sand. The aim of the sand is to retain large and fine particles of dirt to generate clear water. The large particles will settle to form a layer on top of the sand. Microscopic organisms present in the slime around the sand will consume fine particles. On top of the sand, put small stones or gravel. The stones or gravel do not filter any particles or impurities. Their role is to dissipate the flow of water over the whole treatment bed. Forcing the water to flow through this layer spreads it over the entire surface. At the same time, it strains out the particles larger than the spaces between the stone particles. A good piece of advice is to add another layer of sand after the gravel. Follow it with another layer of small stones or gravel. In other words, you will have double layers of sand and gravel/small stones. The benefit of the double layers is a more effective removal of large particles present in water. The next step of learning how to filter water in the wild is to purify it. The water you will have in your cup after it passes through your improvised filtration unit is clear. But, this does not mean it lacks pathogenic bacteria or microorganism. That is to say, filtering does not remove harmful organisms from the water. A good way to get rid of these germs is to boil the water for about 5 minutes depending on the amount of water you need. Your aim is to achieve the BOILING POINT of water. This is because some organisms are heat resistant. Others may actually be inactive in cold water but get activated by heat at low temperatures. Filtered and boiled water may appear clear and clean. In fact, you can go ahead and drink such water. However, the two processes do not remove metals and other trace elements that may be toxic to your cells. Metals such as sodium and calcium may tip your electrolyte balance. This may lead to medical problems. The best way to get rid of such impurities is via distillation. It may be crazy to imagine distilling water in the wilderness. Nevertheless, you can actually improvise a distiller from materials available in the wilderness. Distillation process also eliminates even the most heat-resistant bacteria. To distill, you will need a teapot, a recipient container and a piece of hose. Attach the hose to the teapot and then raise the hose up to a tree branch. Bend the end of the branch. You can then place a recipient container under the hose. Heat the water in the teapot and wait for it to boil. Water vapor will rise in the hose to condense to form raindrops. Such water drops will fall in the recipient container. Note: If you do not have a water bottle, you can use tree stems or branches that have hollow centers. You can then make the filtration unit as we have described above. You have managed to survive in the wilderness. Do not let the lack of clean drinking water be the cause of your downfall. Using what Mother Nature provides, go ahead filter and purify your water. Knowing how to filter water in the wild is as easy as following the above steps. This level of ingenuity requires one to be a smart survivor. Luckily, you are now smart because of what you have just learned. Keep in mind that simply filtering water does not get rid of harmful microorganism. Ensure you boil the water adequately before consuming it to kill the germs. Only then can such water be safe for drinking. Dan Stevenson is an experienced survivalist and chief editor of The Survival Corps. In addition to his primary job functions, Dan Stevenson has been recognized by the survival community for his extraordinary commitment.